This search provoked some really interesting discussion (summarized in the follow-up posting), but nothing of the sort I was looking for. From which you might entertain the idea that the body-location / event-location distinction is simply not a matter of any kind of lexical ambiguity, but is entirely a matter of syntactic relations (and, possibly, constituent structure) — with the body-location adverbials as V-modifiers and the event-location adverbials as VP-modifiers, as suggested in my 3/8/16 posting “Where?” (where I first posted #2). Ruthie intends High Attachment for the adverb again, with the adverb modifying the VP with head feel, and that’s a possible parsing. But Low Attachment, with again modifying the VP with head smashing, is the default parsing, and that’s how Ruthie’s grandmother understands things. The idea would then be that in #1 and #2 the difference in attachment corresponds to a difference in kind of location. Producing a strong sense of difference in lexical meaning. Science and Charity is an oil painting by Pablo Picasso painted in Barcelona in 1897 and now is part of the permanent collection of the Museu Picasso, Barcelona. This is one of the most representative works of the artist’s early years of training and he painted it when he was only 15 years old. 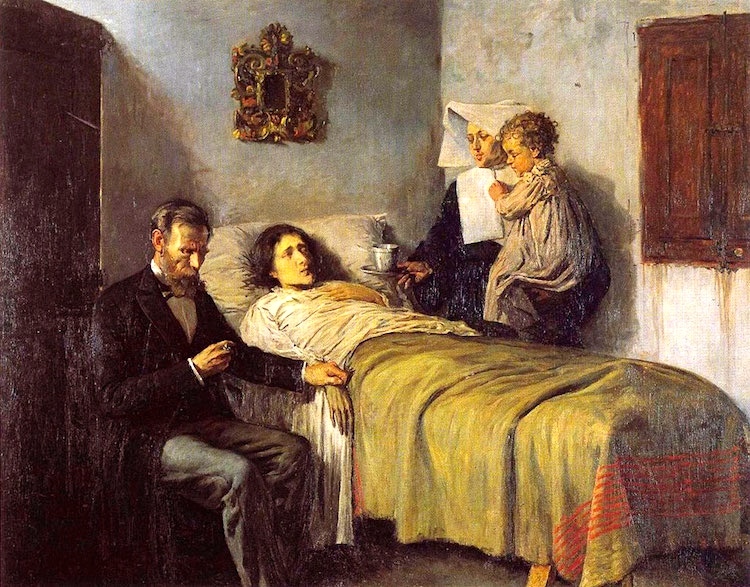 The painting shows a sick patient in bed, with on the left a doctor taking a pulse. At right, a nurse in nun’s habit holds out a cup to the patient, while holding a toddler with her other arm. José Ruiz y Blasco, Picasso’s father, was a professor of painting who felt he had failed in his own attempts to become a renowned artist. He wanted his son to succeed in the world of professional painting and offered Picasso a strong academic background with hopes that he would be featured at the National Exhibition of Fine Arts in Madrid. Picasso began his academic training in Coruña and also studied in Barcelona at the Llotja School. In 1896 Picasso received rave reviews for his work The First Communion, presented at the Third Exhibition of Arts and Artistic Industries in Barcelona. This encouraged his father to rent a workshop for his son at No. 4 of La Plata Street in the Ribera neighborhood, near the family home on the La Mercè Street. It was in this workshop where a Picasso painted Science and Charity. He was 15 years old. It is believed that the work was inspired by Enrique Paternina, Mother’s Visit and A Hospital Room during the Visit of the Head Doctor by the Sevillian painter Luis Jiménez Aranda. Picasso had previously painted a picture of a similar theme (the Sick Woman, painted in Coruña in 1894). An impressive accomplishment for the young man in naturalistic style, not long before he began experimenting with expressionist styles. This entry was posted on April 5, 2019 at 4:08 pm and is filed under Ambiguity, Art, Constituency, Lexical semantics, Linguistics in the comics, Parsing. You can follow any responses to this entry through the RSS 2.0 feed. You can leave a response, or trackback from your own site. I wonder idly why, and what point, the (partially truncated) picture got mirror-reversed. 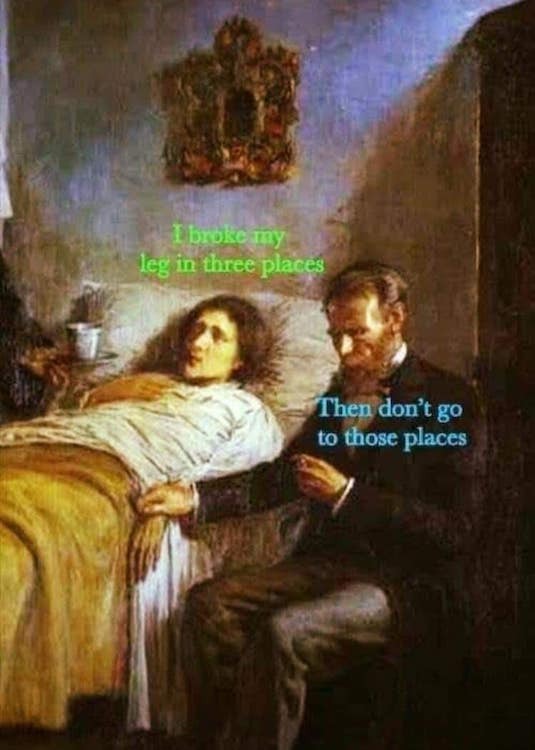 I would guess it was so the patient’s comment would clearly precede the doctor’s, read left to right. Good point, although reading it top to bottom would still accomplish the same thing.